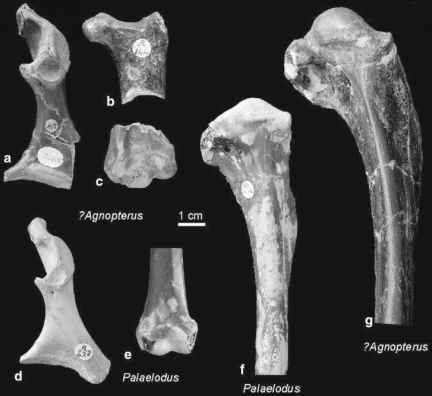 The only Paleogene fossil record of the Megapodiidae is Ngawupodius minya Boles and Ivison, 1999 from the late Oligocene of Central Australia (Namba Formation). This species is known from a tarsometatarsus which measures only two thirds of that of the smallest extant megapodes, to which it is otherwise quite similar in its morphology. Apart from its larger size, this bone also resembles the megapode-like tarsometatarsus of the Quercymegapodiidae, but from a biogeographic point of view an assignment to the stem group of the Megapodiidae is certainly justified. Boles and Ivison (1999) assumed that N. minya lived in wet riparian forests and that its extinction was due to environmental changes.